To me, this is the quintessential recipe – fudgy and chocolaty. The top crackles like bakery shop brownies. And the best thing is you can whip out a batch without breaking a sweat. 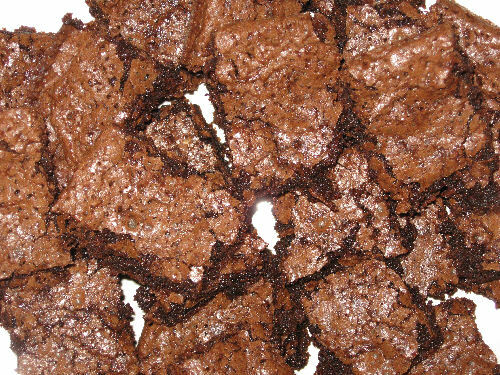 I’m a purist and prefer not to have nuts in my brownies, but you can add them if you wish. Pour a glass of really cold milk and dig in. In a medium sized pot, over low heat, melt the butter; remove from the heat. Add the baking cocoa and sugar. Stir. Then stir in the eggs. In a separate bowl, whisk or sift together the dry ingredients; stir this into the cocoa mixture. Stir in the vanilla, then stir in the chocolate chips and if using nuts, now’s the time to add them. Spread this out into the greased pan and bake for about 30 minutes. They’re done when they start to crackle and pull away from pan slightly – don’t under bake them. Place them on a cooling rack to cool completely. Once cooled, cut them and place on a plate or two, then place in the fridge for at least 1 hour. This may be the hardest part, but they need to cool so you can cut them. If you can’t wait, why not try a spoon? To really gild the lily, once cooled and set, dust with confectioners sugar. Wow! ARE THESE THE BROWNIES YOU SENT TO ME AND EESA? THE ONES WE FOUGHT OVER? I’M GONNA MAKE THESE, YUMMY YUMMY!!!!! 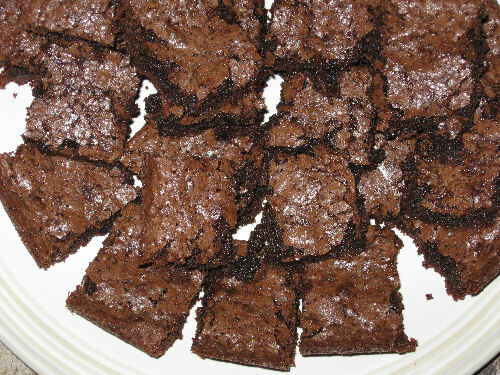 I’ve never made brownies from scrach before, I think I’ll try this. Amy, you’ll love them. Happy baking!